The Friends of the L&N Depot are asking for your help in the 2nd Annual L&N Depot: Christmas in Scottsville Event. We are asking you or your organization to put your imagination to work and decorate a tree to donate for display at the Washington Center. During this time, the public will be able to purchase your donated tree and make a tax-deductible contribution to the restoration of the L&N Depot to preserve a piece of history in our community. This is the perfect opportunity to support our community, advertise your organization, and eliminate some of the holiday stress that comes with decorating! 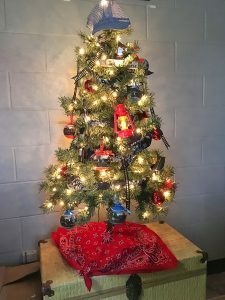 What: Your decorated Christmas Tree! THERE WILL BE A GOURMET HOT DOG BAR AVAILABLE on SATURDAY! Please RSVP by November 24. An information and entry form are attached. Contact (270)-622-1426, or (270)-622-8951with any questions. We appreciate all participation and support! !